Located at the heart of the Tohoku region in Sendai, the new Washington Hotel is dedicated to providing you with a comfortable stay. Its convenient location gives you easy access to major train lines such as the Tohoku Shinkansen, the Tohoku Main Line, the Senzan Line, the Senseki Line, and the Sendai Airport Access Line. 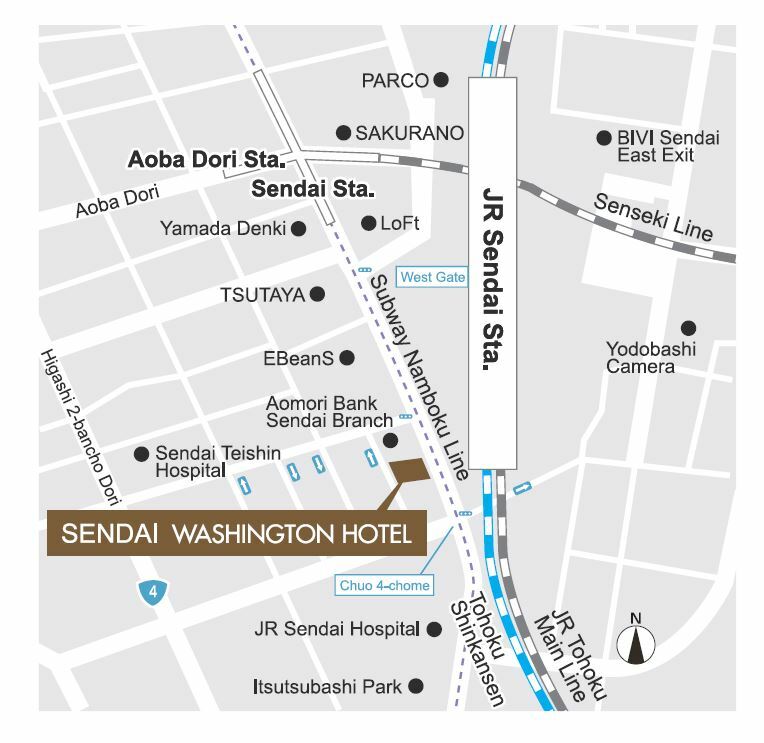 The hotel is located near the West Exit of Sendai Subway Station. The city of Sendai and the surrounding area are places of thriving business. There are also plenty of places to enjoy some sightseeing such as Aoba Castle (Sendai Castle) and Osaki Hachiman Shrine. Then there is also Matsushima, a group of pine tree-covered islands that is considered one of Japan’s three most beautiful sights. Other attractions include the national treasure Zuigan-ji Temple, the national park Zao, the Mountain Temple (Risshaku-ji), and the World Heritage Site Hirazumi. Enjoy the delicious specialties of Sendai such as beef tongue, seafood caught fresh from the waters of Tohoku, or delicious vegetables from the mountains of Miyagi Prefecture.